David was born in Surrey, but has lived in Sussex for many years where he now has his studio. He comes from a well known artistic family – his great aunt, Edith Holden, had her diary for 1906 published as “The Country Diary of an Edwardian Lady”. 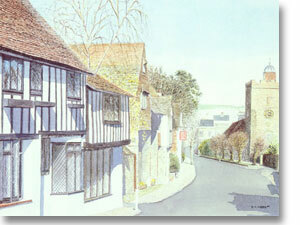 David began his artistic career in 1993 producing watercolours of landscapes and townscapes of Sussex and Surrey. He held a number of highly successful one man exhibitions during the mid 1990s. Following this he launched his publishing company, Tudor House Designs, which publishes and distributes an ongoing range of high quality prints and greetings cards. The cards are on sale in numerous outlets in the South East of England and can also be purchased direct from his studio by mail order.